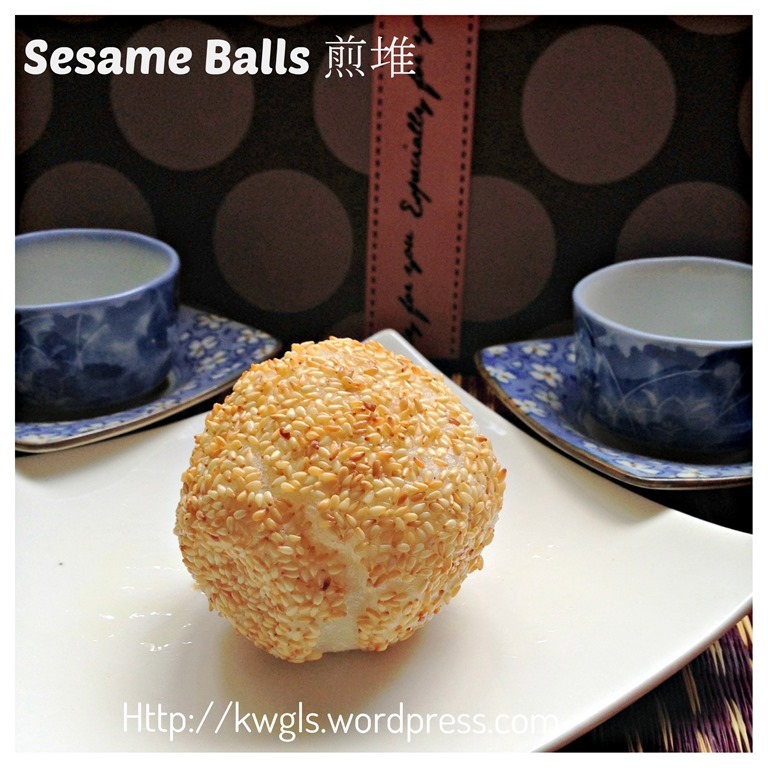 Updated post on 24-August 2014, please scroll towards the end for the updated post. Possibly the heat used for deep frying is too high. Because of this, in this post, the recipe will be adjusted to exclude baking soda or baking powder, using low to medium heat instead of high heat for deep frying and increase the dough to filling ratio from the initial of 1:1 to the revised 1:5:1.Based on these adjustments, I honestly believed the recipe is definitely a doable recipe since it was not much different fro any other recipes in the internet. 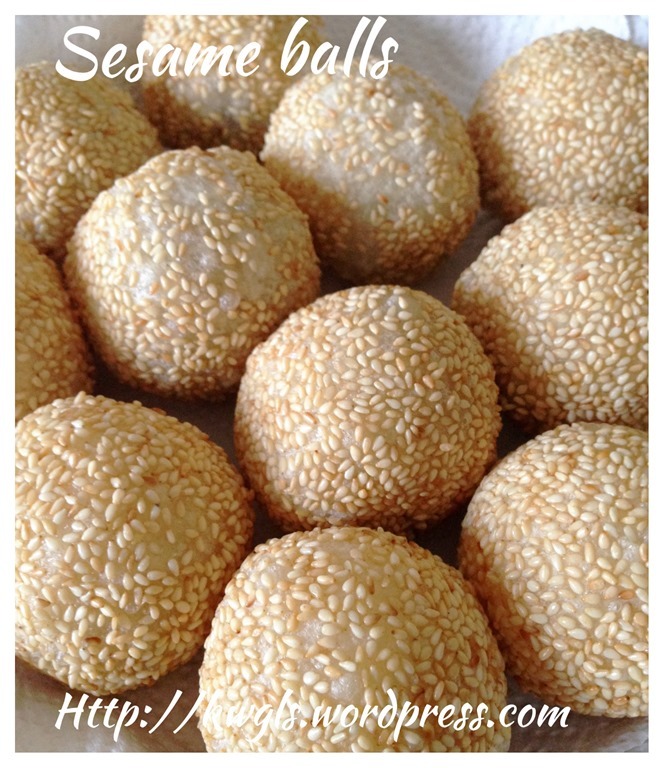 Having said that, the ugly sesame balls were delicious as the skin were very thin and with lots of fillings inside. 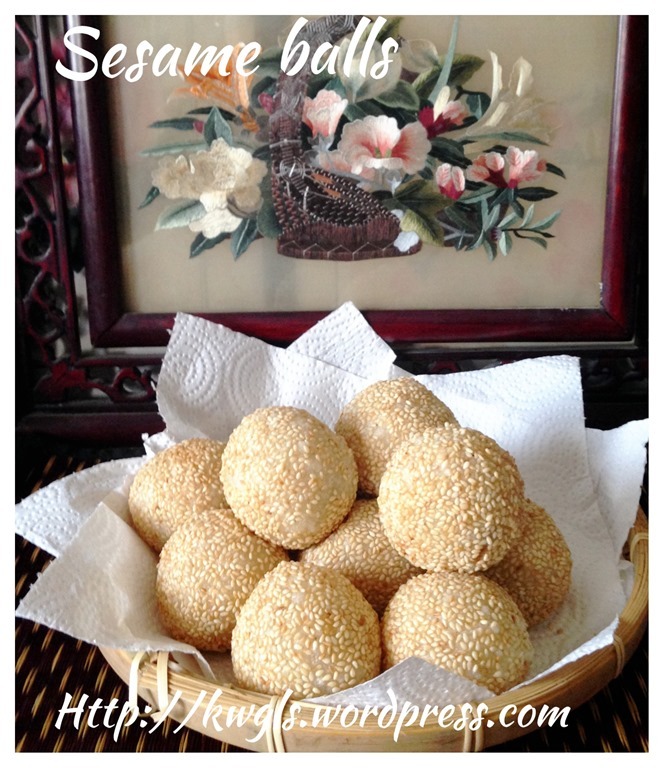 I have prepared two types of fillings for the sesame balls. 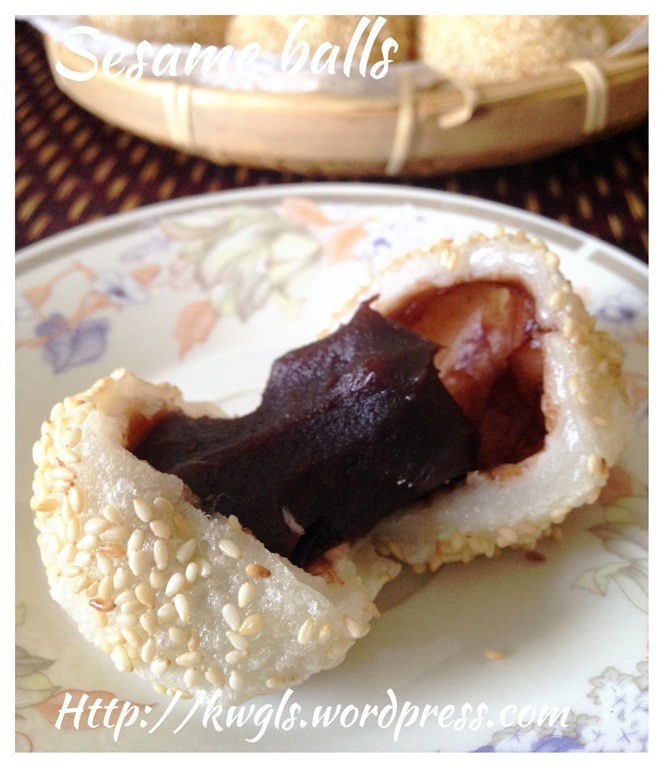 One is the ready made red bean paste that can easily be purchased from the bakery shop and another is homemade peanut fillings. 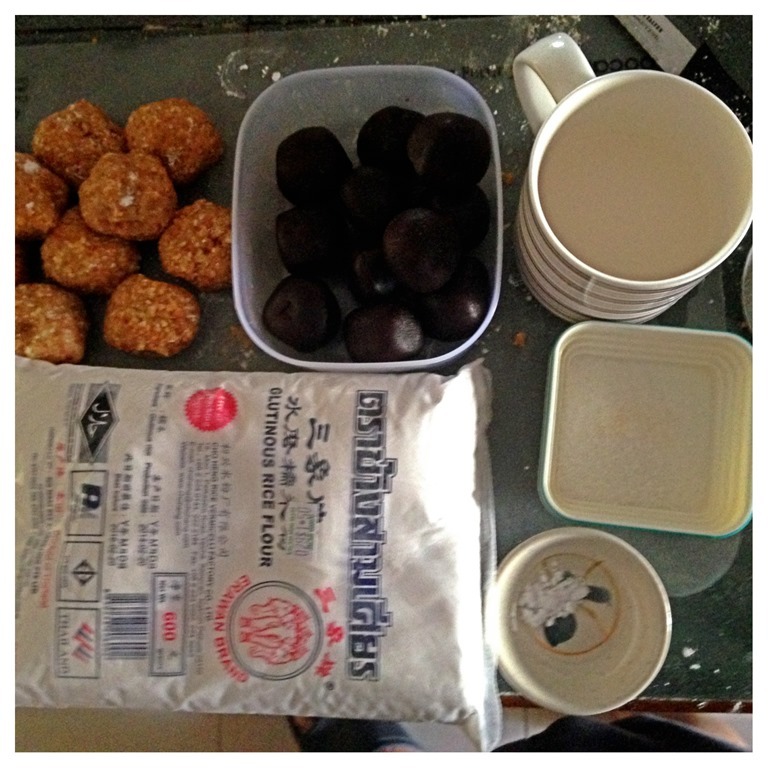 300 grams of ready made red bean paste. 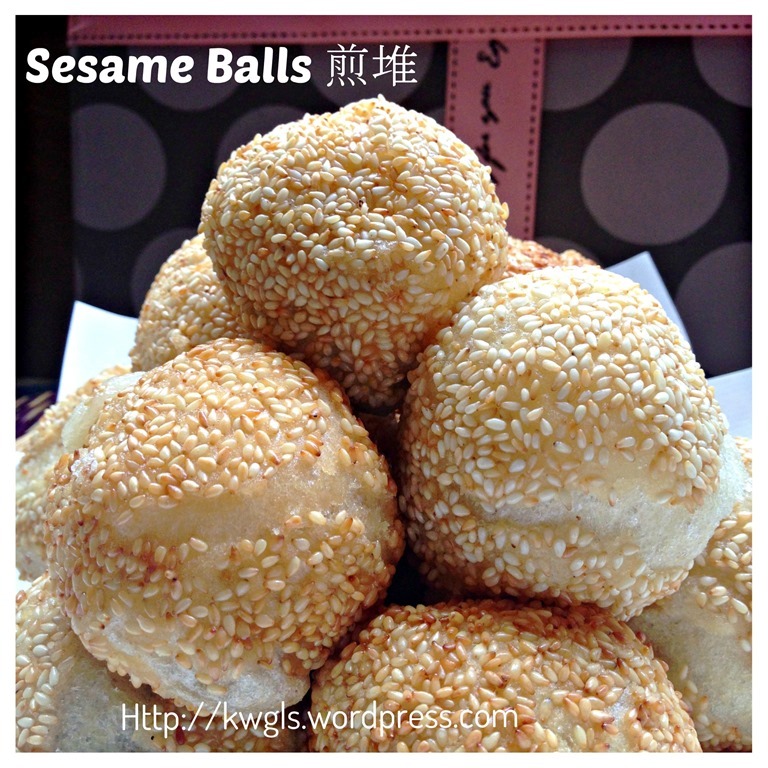 About 50 grams of roasted sesame seeds. 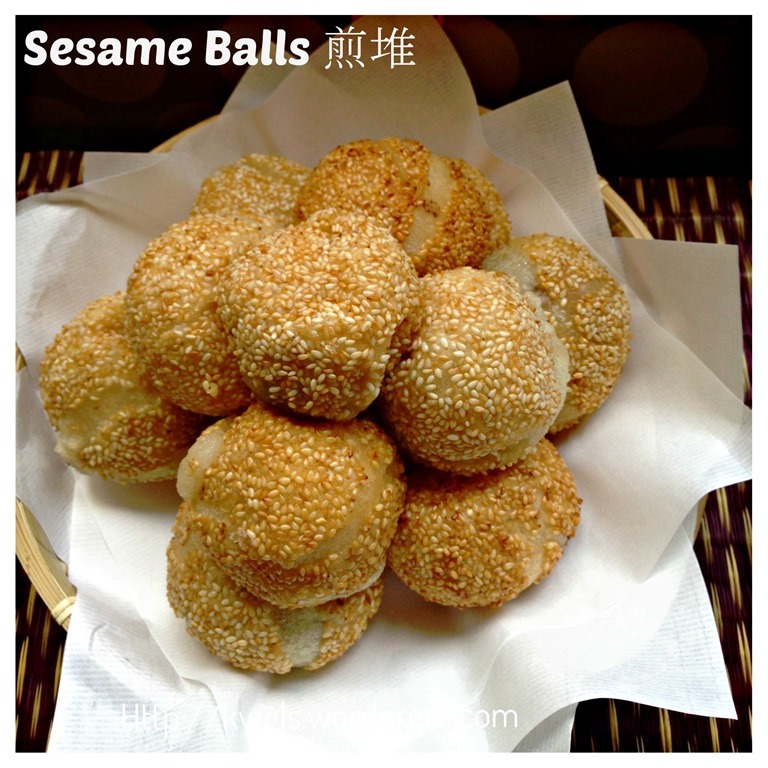 The dough to filling ratio have been adjusted to approximately 1.5:1, meaning a thicker skin such that it will not break when deep frying. 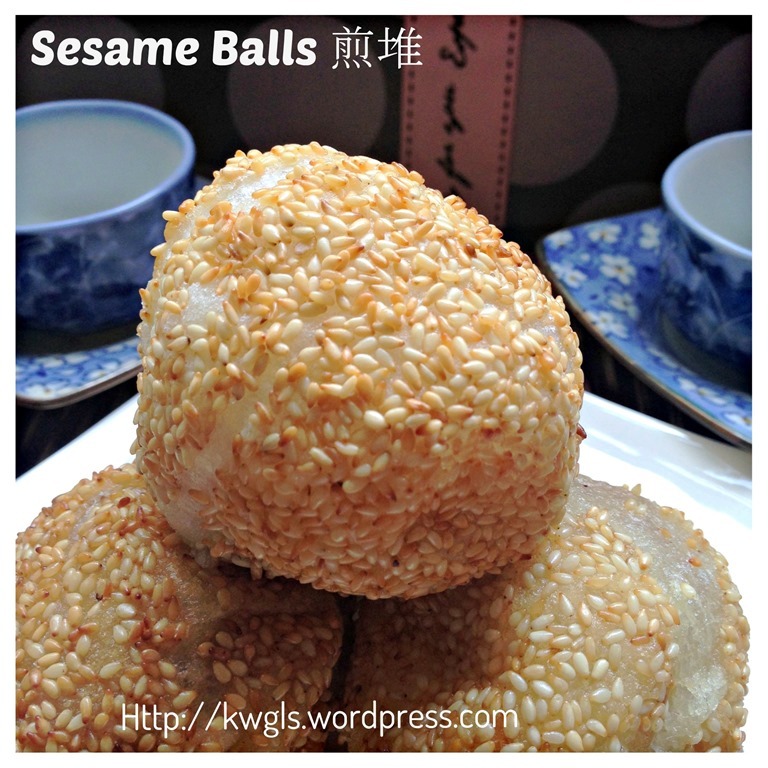 In a bowl, place the the grounded peanuts, sesame seeds, flour, sugar, cooking oil and water. Use a spoon to stir until well mixed. 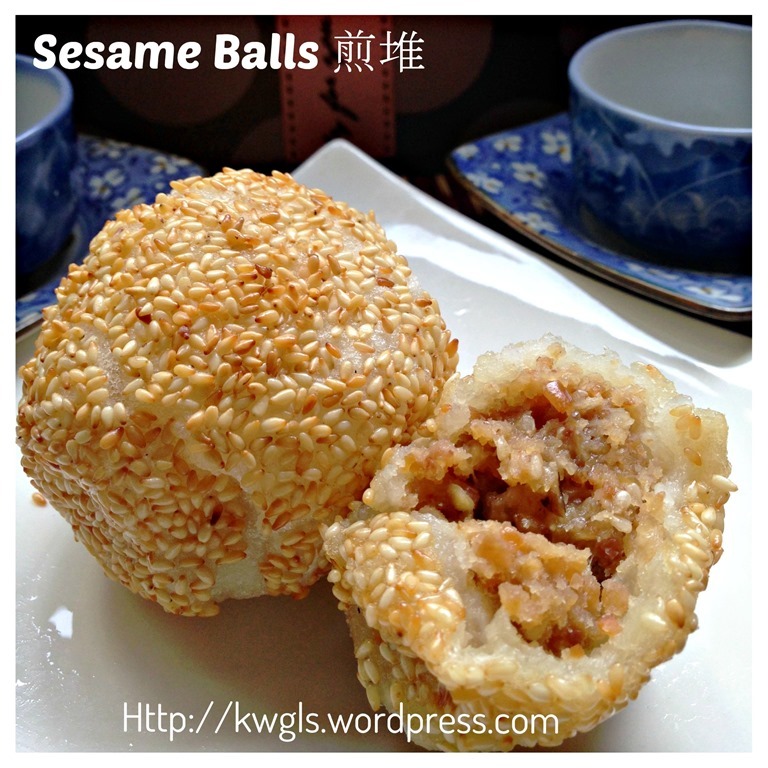 Divide the dough into 15 portions and make it into a ball and press it as tight as possible. 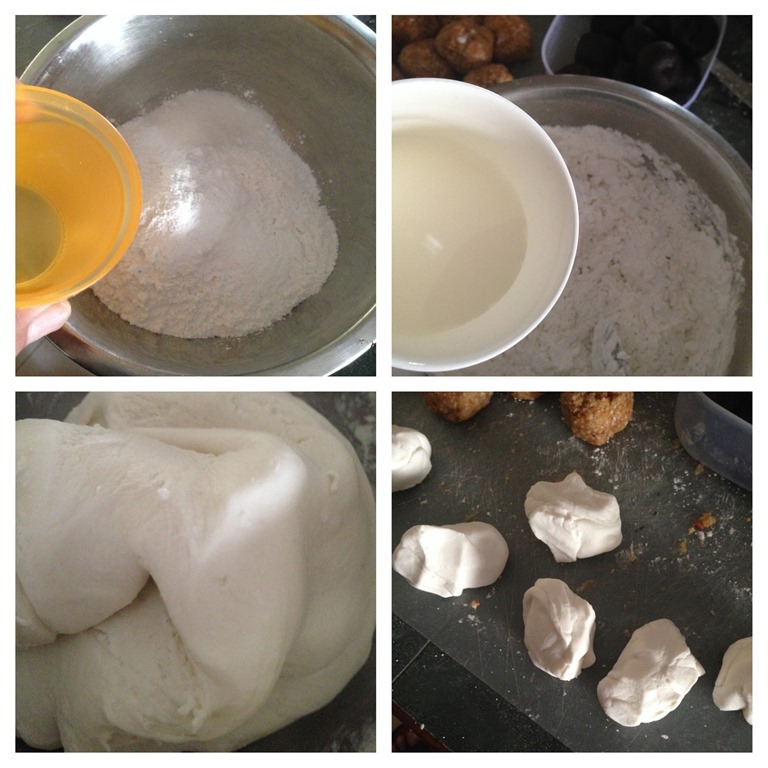 If it is too dry, gradually add in additional water until a pliable dough is formed. 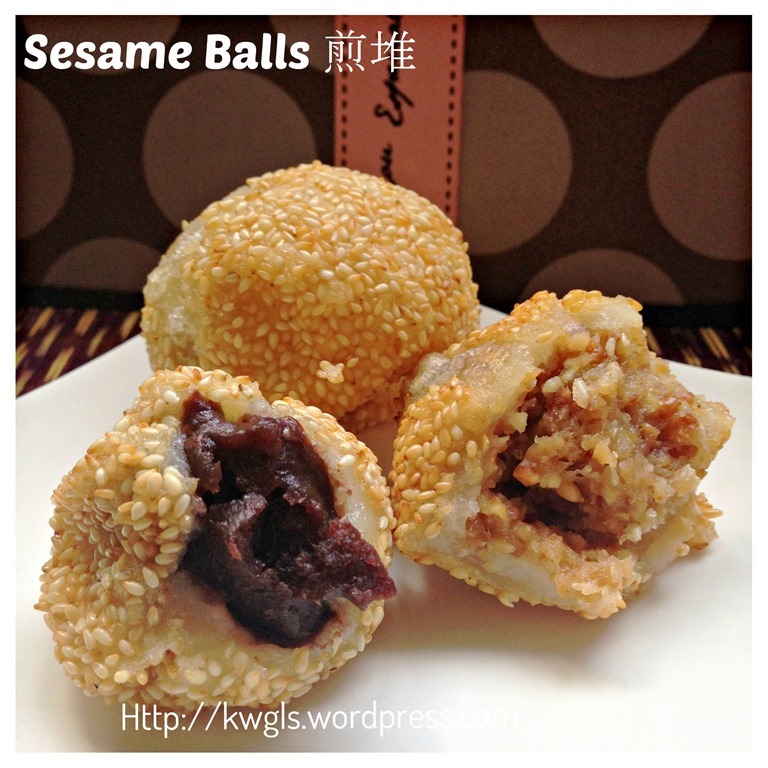 If you are using the red bean paste, divide into 15 equal portions and shape it into a ball. 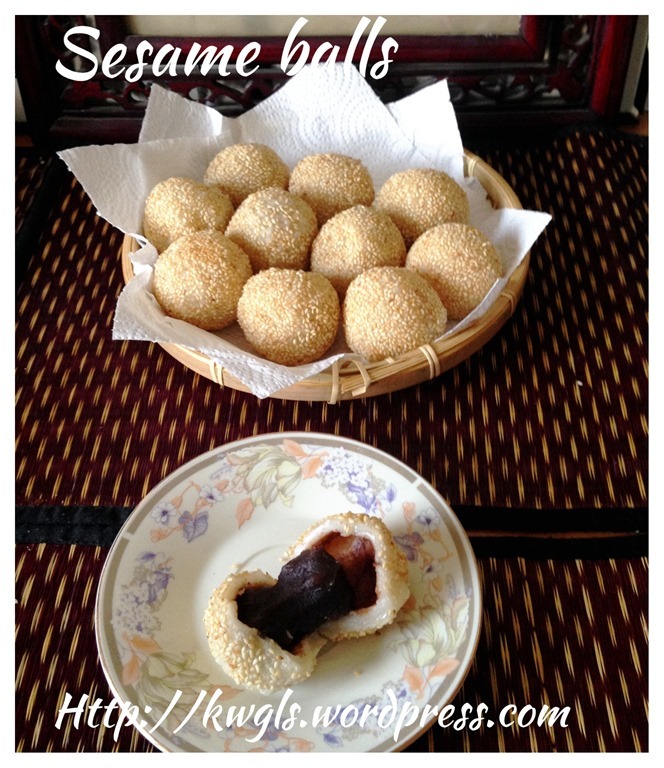 In another bowl, place the sifted glutinous rice flour, cooking oil, sugar and wheat starch. Make a well in the centre, pour in the boiling hot water. Use a spoon and stir it until a paste is form, add in the milk and knead until a pliable smooth dough is formed. Divide it into 15 equal portions. Take one portion of the dough, shape in round, flatten it. 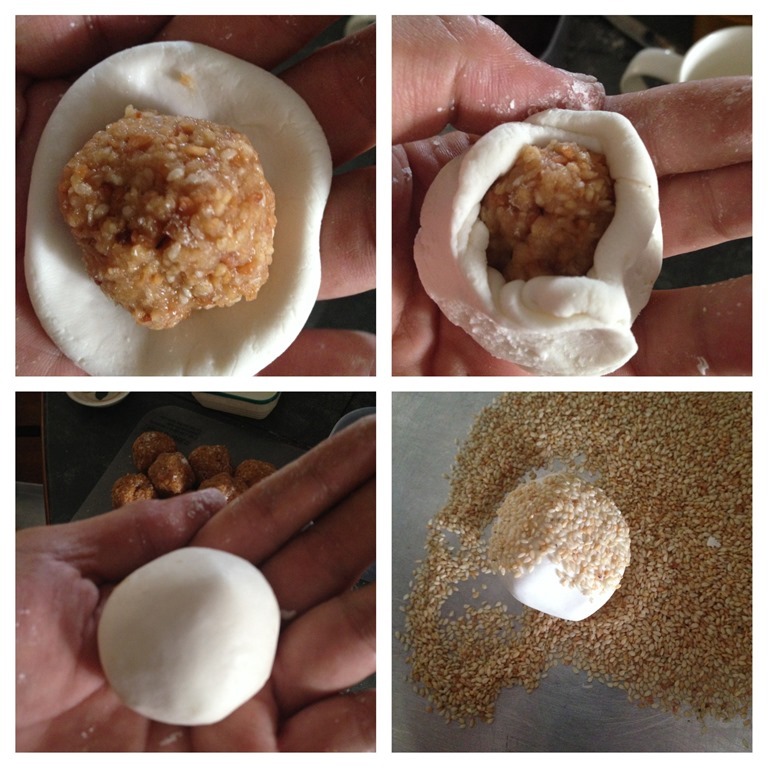 Put a filling ball on top of the dough.. Seal the edges and shape in round. 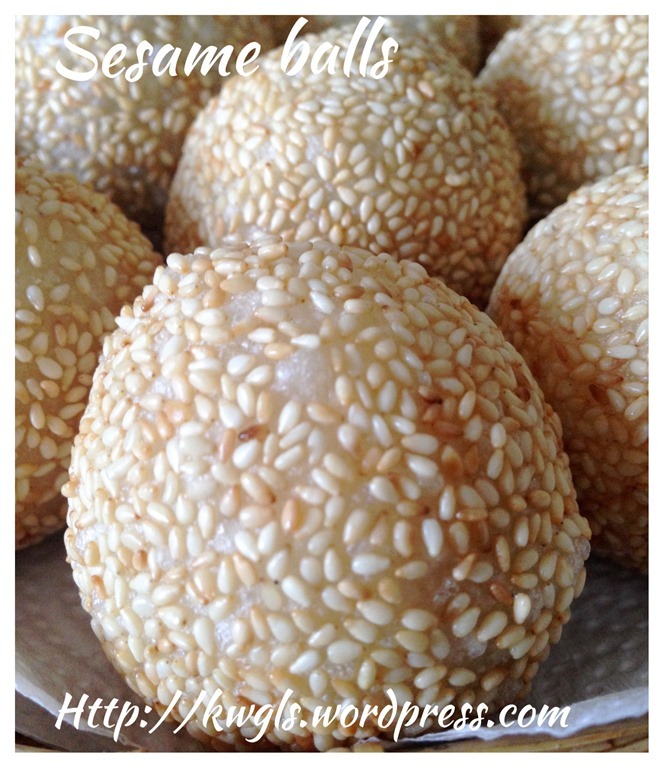 Pat the glutinous rice ball with some water on hand, roll in a plate or bowl of roasted sesame seeds until the ball is fully coated with sesame seeds. Perform the same for all the remaining 14 portions. Set aside for later deep frying. Heat up a pot of hot oil. Use a chopstick to test the readiness of the oil temperature for deep frying. 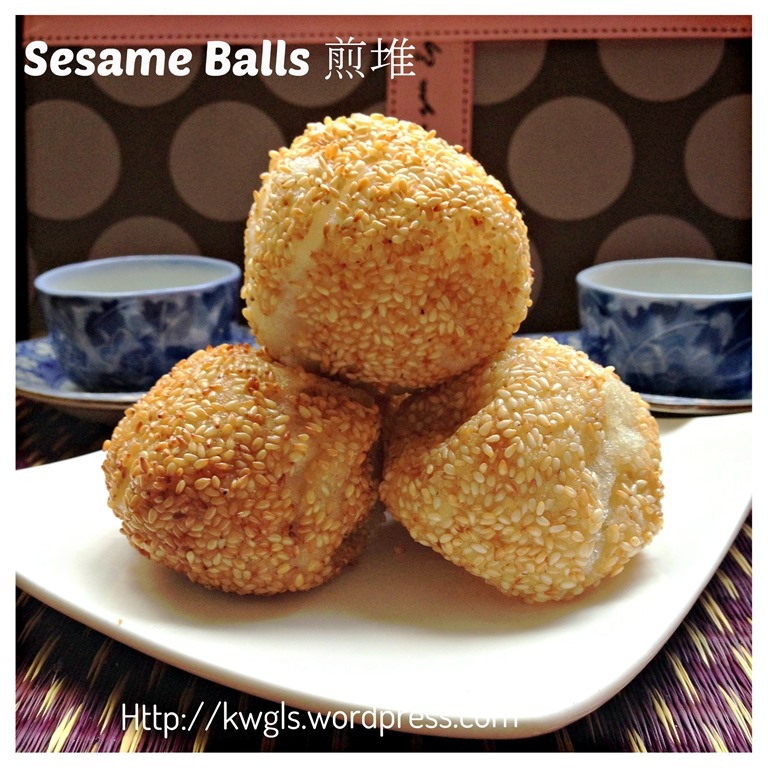 The oil is considered as ready when a chopstick inserts into the oil, bubbles start to emit. Reduce the heat to medium or low. Put the ball carefully in the oil using a spoon. 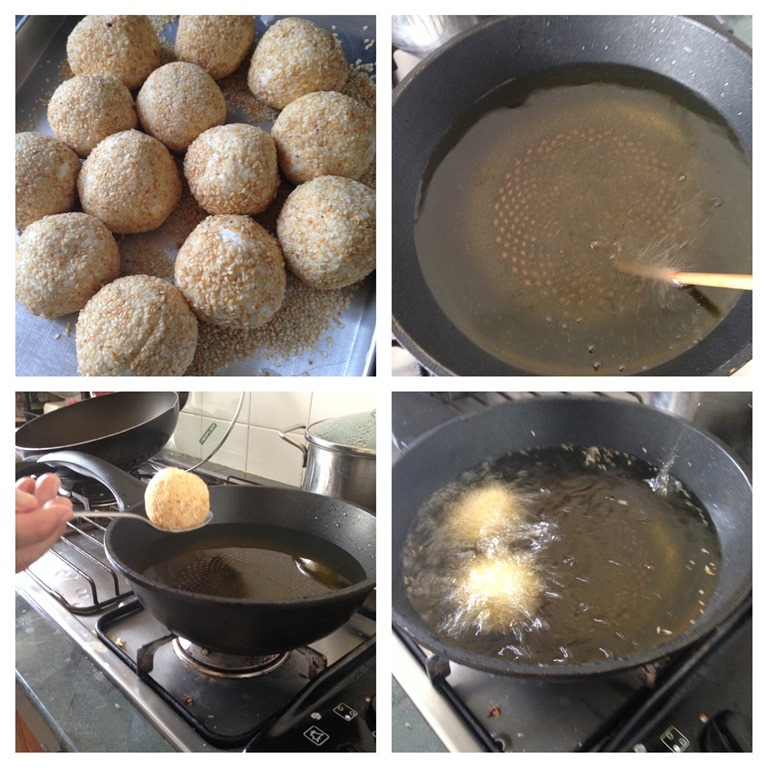 Deep fry for 3-4 minutes until the balls starts to float and the outer layer becomes golden brown. Best served when it is warm as a snack. 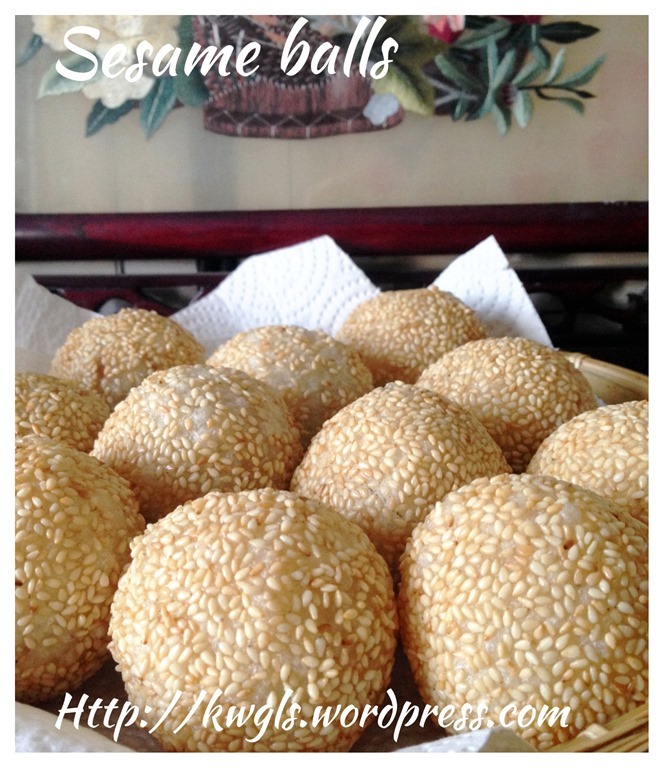 Though my sesame balls are ugly, however, taste is awesome because the skin is very thin. 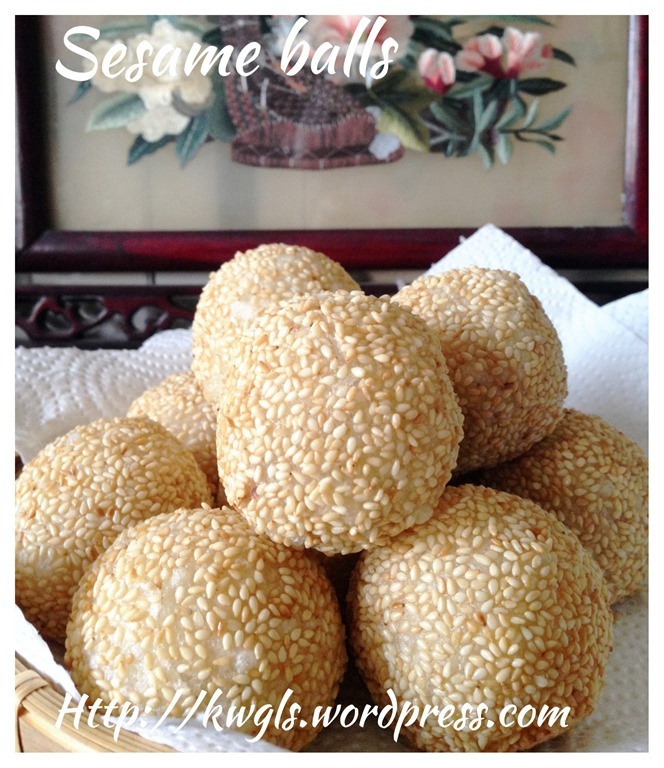 However, after adjustment of the original recipe, it is unlikely that your sesame balls will break as seen in this post. Pardon me for the poor pictures in the post. My dough to filling ratio have change from about 1:1 to 1:0.7 meaning, 25 grams of filling with 35 grams of dough. The balls did not break and I am happy with the outcome. 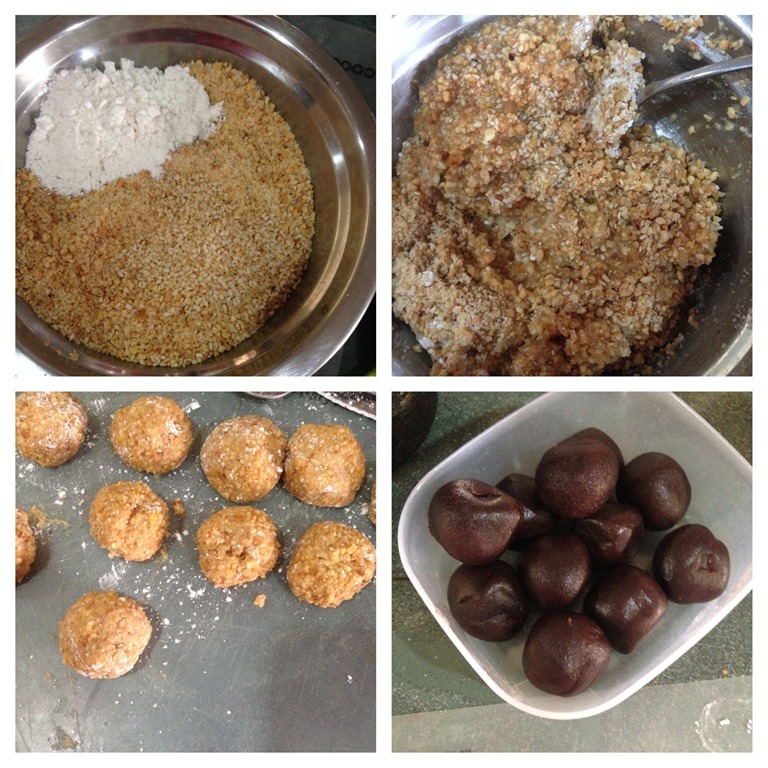 All the above changes have been properly reflected in the recipe above. 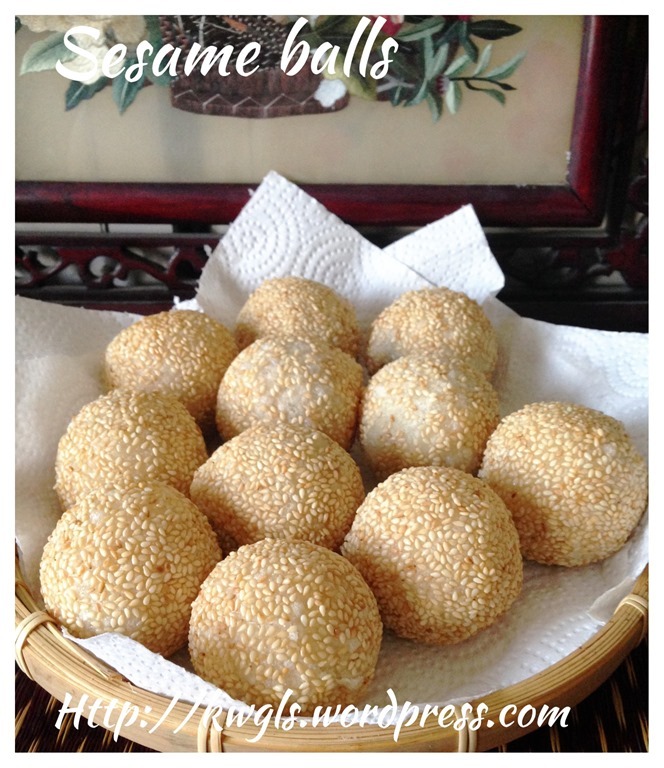 This entry was posted in Chinese and Asian Cakes and Snacks, Food Preparation Series, Snacks and tagged 8, 煎堆, 芝麻球, glutionous rice balls, GUAI SHU SHU, Guaishushu, Jian dui, kenneth goh, kuih bom, onde onde, postaday, Sesame Balls. Bookmark the permalink. I will have to try that sometime. 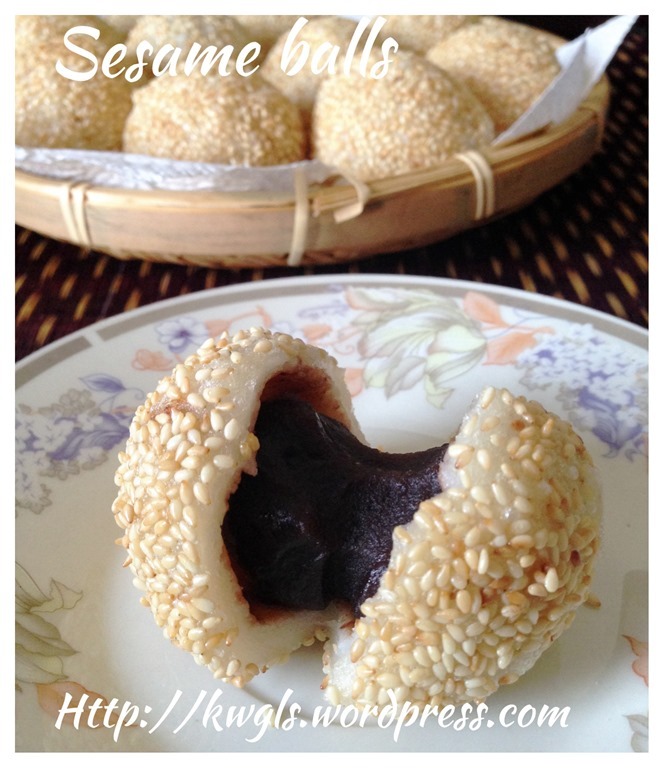 Those things are addictive at the dim sum restaurant.